The Dwindling Power of a College Degree - it was never a guarantee. The last line strikes me as something we should always do: prepare for the worst and hope for the best. "The increasingly vicious battle between left and right is, at the most basic level, a dispute over how to respond to these new rules. Republicans largely claim that the new rules will make the country richer and, in the long run, will be beneficial to everyone willing to put in the hard work. Few Democrats call for a return to record high taxes and trade barriers — after all, the free flow of cheap goods has helped many, particularly the poor. But many do want a return to the spirit of the old rules, when the government sought to make life more equal, more stable and, for some, less rewarding. The rest of us, meanwhile, should go to school, learn some skills and prepare for a rocky road." 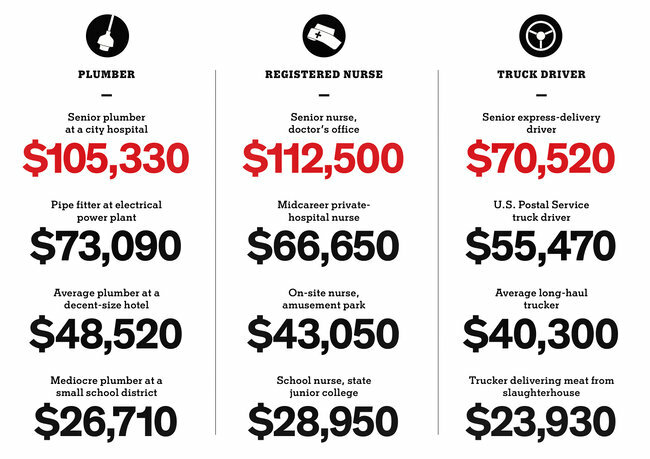 And I'm not sure that I think it is a problem that the best nurse, plumber, or truck driver make a lot more money than the worst nurse, plumber, or truck driver. Oh.... WOW very nice blog here. I was searching something like this. I have bookmark this web page and will come back again.